That was a great win but man the Cards seriously stink. If Bradford keeps this up they’ll have Rosen starting before the end of the season. Bradford looks like an old slow QB who can't move around at all. I was surprised at how bad he looked. He started for the Vikings week one last year and was flawless. He's probably made over 100 million dollars and literally has done nothing in the NFL. Looks like moving on from Cousins and getting Smith was a good move. Cousins didn’t do anything for the Vikings in the 4th. Instead of simple getting to the first down marker and kneeing it down to win the game right there by then running out the clock, ego takes over with Peterson. Not a confidence booster as that was just selfish. At some point u must play smart over instinctual. He had a great day otherwise. Very pleased!! Oh yeah, very happy coach went for the win via pass to Peterson to be the final play to run out the clock. THe also had a defensive TD, and they weren't very good on 3rd down either. He must have meant Quinn right? I'm hoping it only was because of defense strategy for David Johnson. 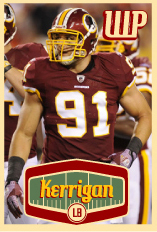 Little to no pressure by Kerrigan and Smith is pretty disappointing..
Apke, Quinn and Sims - rookies had it rough. Apke looked like a hammy, and ankle injuries for Quinn and Sims. I hope everyone is ok.